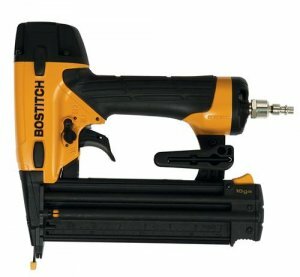 Bostitch has a new 18 gauge brad nailer, and it looks like it has it all. Some of the key features this gun has that I like in a nail gun are the oil-free driver motor, and anti-dry fire. It is easy to forget to oil your guns, and sometimes difficult to know how much oil to add. Being oil-free, as simple as it sounds, makes maintaining a nail gun a much easier task. Anti-dry fire, for those who have not heard of this, is a feature that does not permit the nail gun to fire nails when it is running low, or out of nails. For anyone who has tried to install some crown only to find out you were out of nails 20 shots ago, you know what a great feature this is. Shoots fasteners 5/8" - 2-1/8"